The Round Robin Photo Challenge for today is PUBLIC ART. The Unisphere, commissioned to celebrate the beginning of the space age, was conceived and constructed as the Theme Symbol of the 1964/1965 New York World's Fair. The Theme of the World's Fair was "Peace Through Understanding" and the Unisphere represented the theme of global interdependence. It was dedicated to "Man's Achievements on a Shrinking Globe in an Expanding Universe." 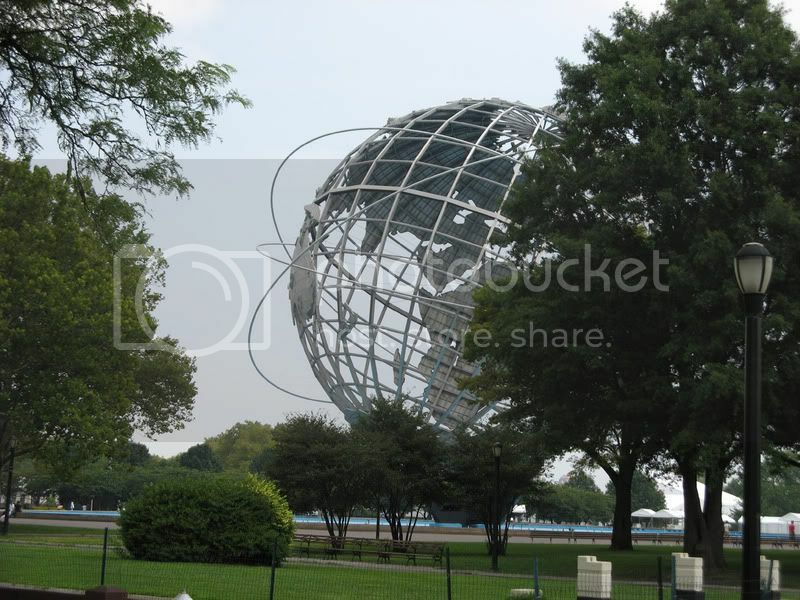 Designed by landscape architect Gilmore D. Clarke, the Unisphere was donated by the United States Steel Corporation and constructed by that company's American Bridge Division. It is the world's largest global structure, rising 140 feet and weighing 700,000 pounds. Some sources say the Unisphere weighs 900,000 pounds, a figure which includes the additional weight of its 100-ton inverted tripod base. The diameter of the sphere itself is 120 feet, or 36.57 meters. It is constructed of Type 304L Stainless Steel. The Unisphere is located in my home town, Queens, New York. Amazing piece of art. Thanks for all the information also. 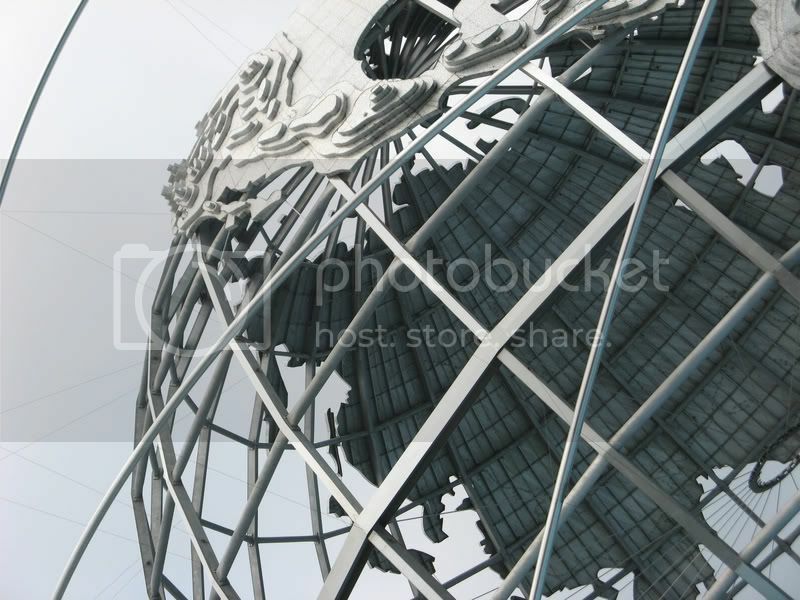 These are wonderful photos of the Unisphere. Nice angle on the middle one. I love seeing photos of this. Someday I hope to see it in person. Oh, now you're making me homesick! Was raised in Queens Village, from age 3 through 16 (and then transplanted to Long Island until two years ago). I was very little but remember the World's Fair keenly - especially all the Disney stuff. And now you know why I'm such a rabid Disney fan - he got me at an early age. How interesting, never seen or heard about it ! 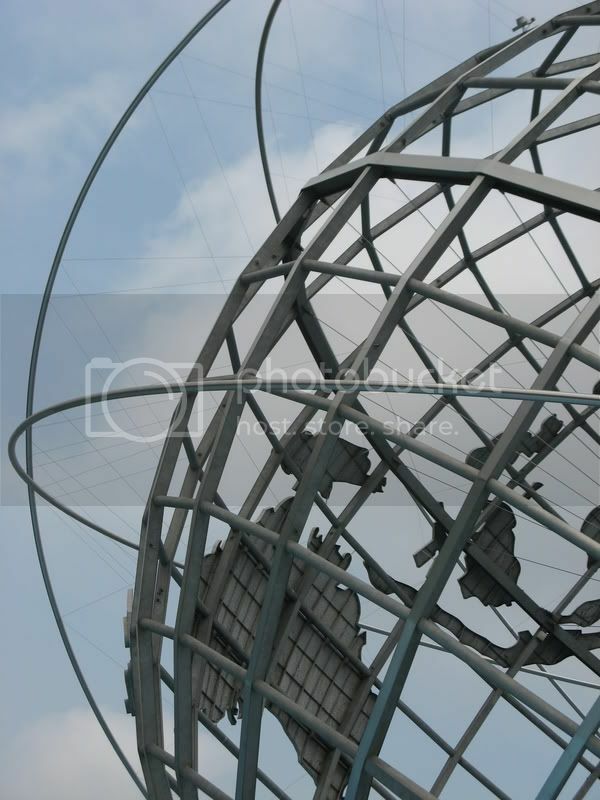 Nice shots of the Unisphere! You You live in a great spot for seeing and photographing art. i love the most the last! great shot the teach! hope to see more! This is so cool. I wish I could take a picture standing in front of this. I have tons of my parents standing in front of it during the NY World's Fair. Hey, I've actually seen this one! It really is wonderful. The way the light and lines change as you go around it is hypnotic. I know it sounds ridiculous, but I'm in tears here. I was at the NY World's Fair (not sure whether in 1964 or 1965), and the Unisphere has stayed with me all these years as something I really loved. It's a beautiful thing, and I especially love the detail brought out in your second and third shots. Many thanks for that, and for the further info on it. Funny how, nearly 45 years later, we're still grappling with the very same concepts! That's something I would love to see in person. I think it's cool. My SIL and her family live in Queens. She works for the NYT; last year, around the time of the US Open (which would be now! ), she did an online feature of things that happen in and around Queens that are NOT related to the US Open. She showed this globe, of course.